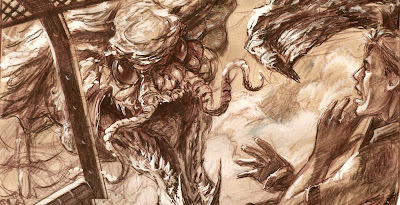 Here is the part three article of my Tom "Thor" Thordarson artwork tribute. 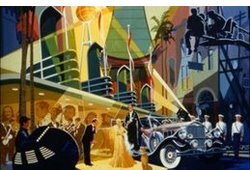 After being Director of Attraction Development at MCA Universal Studios, Hollywood, Tom became a WDI Disney Imagineer with his role as a Director/Senior Concept Designer. 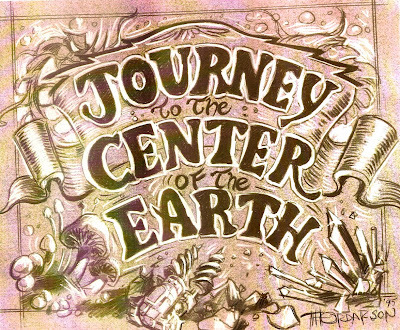 Among his many assignments at Disney was the task of the concept design for one of the main "E-ticket" rides for the new Tokyo Disney Sea theme park in Japan called, "Journey to the Center of the Earth" the top rated thrill ride of Tokyo Disney Sea. 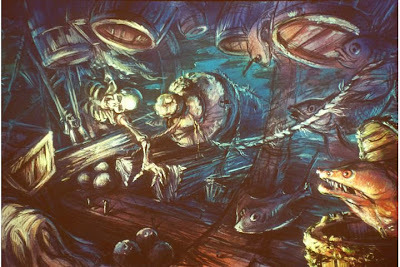 Tom was also a key team player in the early design phases of many other attractions for Disney Sea, especially 20000 Leagues under the Sea at Mysterious Island. 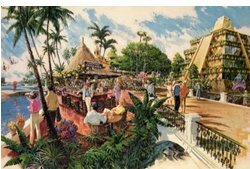 Those of you who had the luck to visit this gorgeous theme park and remember Mysterious Island rides will see below how important Tom Thordarson's contributions were to the design of these rides. First, i want to thank Tom very very much for the beautiful artwork and pictures he kindly provided to me for this article. "When I was first invited to be part of the TDS team, it was truly a project that I cannot recall being more excited about. 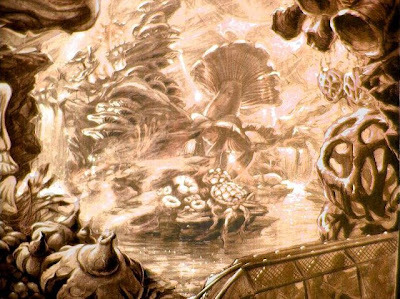 Mysterious Island, with it's magical energy full of classic adventure was where everyone knew I belonged focusing upon, though I played with concepts for Port Discovery as well. They basically said: "This is based on the Jules Verne book in general, but give us your take on it." 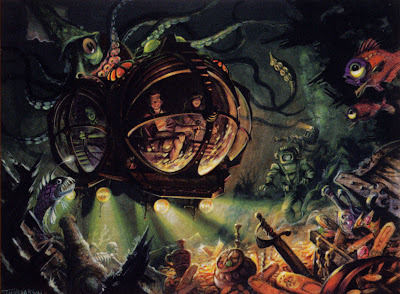 Disney had explored it loosely as a studio tour designed by Scott Sinclair, but I was allowed to use or scrap any past ideas as to the content of this story as it would become a ride. I watched the movie with Pat Boone and read the book. I sat in my office at Imagineering for close to a year creating this ride in countless drawings, storyboards and paintings. I presented this ride again and again and was told by staff that my sound effects and enthusiastic body gestures were a "hard act to follow". lol! Michael Eisner was chuckling and well entertained repeatedly at my performances, I recall well. One Corporate Exec. stated, as I finished the very first presentation with my story boards, "Is it HOT in here..or is it me? I truly lived this ride...over and over and by the time it was in show model form, I felt I had ridden the thing a thousand times. 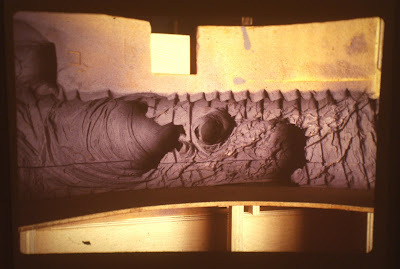 Every rock form, creature and sound was something I had to describe to the team in drawings and verbal dramatizations." 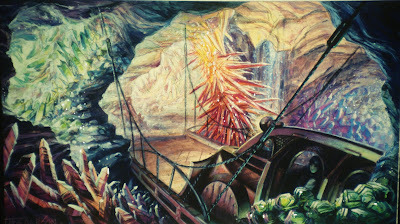 The first paintings below are Tom's artworks for "Journey to the Center of the Earth", Mysterious Island's feature ride. They are presented here in the chronological order of the attraction (If I'm not mistaking!) and also with some pictures that were shot before the opening, all from Tom's personal collection. 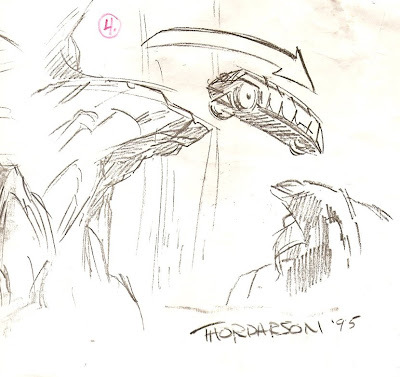 Here is Tom's design for the "Terravator" - the lift which "carries" the guests "deep down" to the load area. 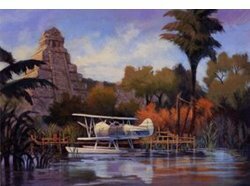 This next artwork is Tom's painting for "Journey" load area. Long before it was built. 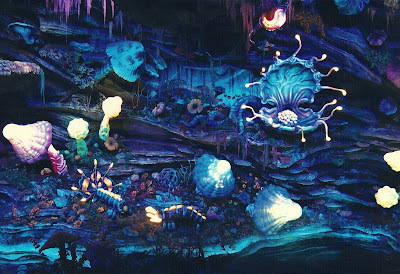 All the decor of "Journey to the Center of the Earth" is, of course a "subterranean" decor. 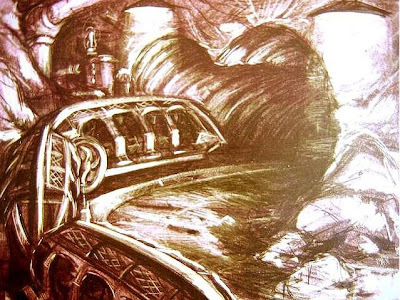 So, as it is often the case at WDI, Tom and his early team went exploring caves for references for Journey's design. Tom is on the bottom right of the second picture. Tom says, "I could go on forever telling everyone about the details. 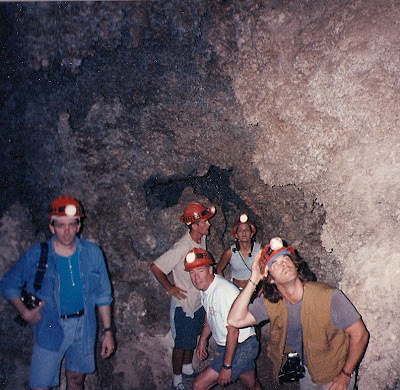 I have included pictures of one of my early research trips into actual caves where i took countless photos. 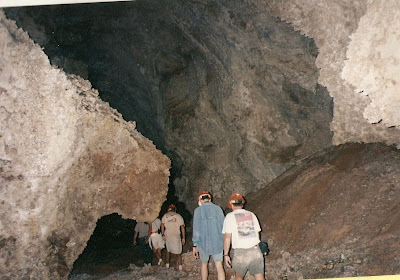 We had rangers take me deep into the caverns below where most people have ventured in tours. But I had to make all this bigger than life. I had to learn from real nature, but then project a sci-fi logic to the rest." 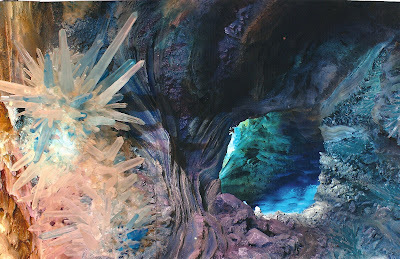 The painting below shows the entrance of the vehicle inside the "crystal scene". 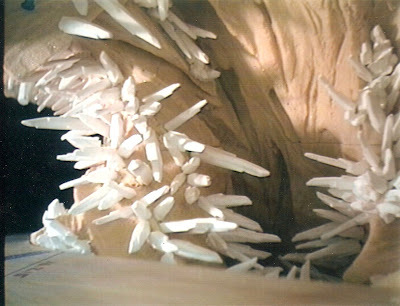 ...and also pictures of the model of the crystals scene, where Tom placed every Crystal in miniature. All translated accurately into the final ride. 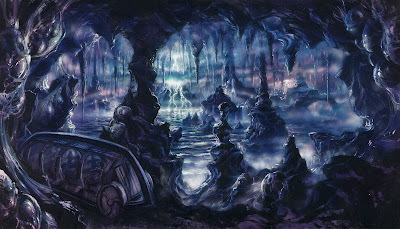 Tom now explains more about this scene and how he designed these "crystal vortex's". 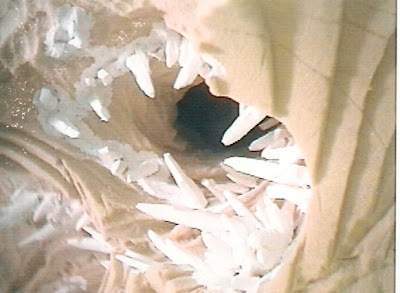 "I placed ever single crystal in the model for the rockwork department to chart and blow up to scale in the actual ride precisely. The way this looks is all out of my head...not anything real. I designed this "Vortex" of crystals as an idea where there was a "swirling energy" in the earth that caused these formations..like a magnetic tunnel. All the rock formations from the beginning to the end, I designed to have a psychological effect. In the beginning, the forms are friendly shapes like swirls and circles and crystals. As we move into the more dangerous and dramatic areas, I designed the look to be sharper and actually look like the rock shapes are "pulling you" or forcing you towards the creature and out the volcano's eruption. Again, when I design a ride or even just a painting, every form tells a story. Rock...seems simple but it is a stage and opportunity to tell a story...that can allow us to control our audience's emotions, depending on how we stage it." ...And a picture of the crystals with the show vehicle. 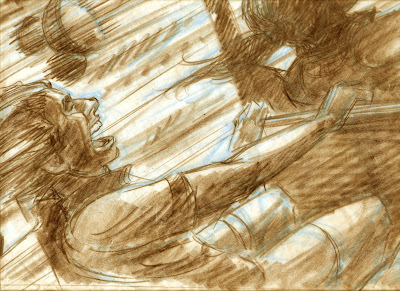 Tom also did all the storyboard sketches for the ride like this one below. 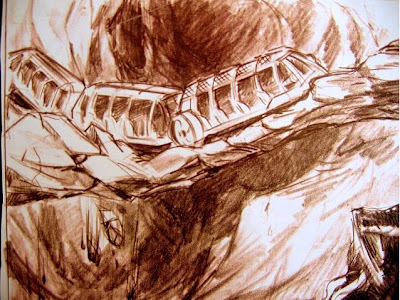 As you will note in the early concept, Imagineers envisioned a kind of "train" of three vehicles together. 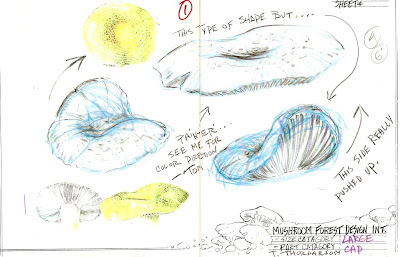 ...Two "fabrication drawings" for the mushrooms of the mushrooms forest scene. Tom had to draw all these details for construction. And one painting for the same scene. 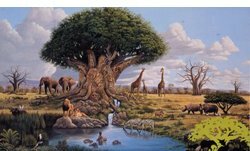 Did you note these little animals with their back colour red on the painting above? Well, Tom did this next artwork to describe how these life forms should look with a "phosphorescent" back. This next one is a "Moss Plucking Skenk". They were both ideas...but the one below became the final design. 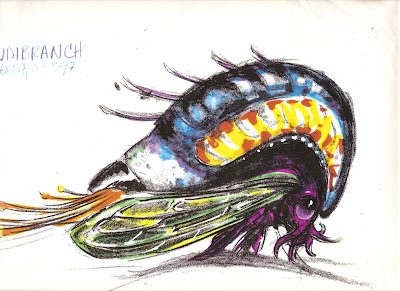 Tom also designed this "Winged Nudibranch", a drawing for the production team. The two next pictures are rare photos of the real decor, also shot before the park's opening. Tom recalls, "In the Giant mushroom forest, I made it all up on my own. The movie was really fake and unimpressive. 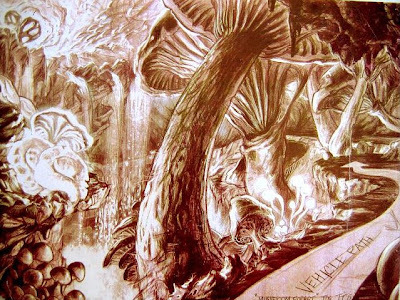 So, I researched real glowing fungi and mushroom species'. 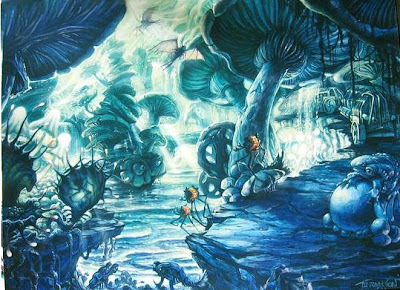 I created a world where light came from the natural bio luminescent mosses and plants and the water was full of phosphorus plankton. This thinking made me believe in my story and so I could paint it and describe it to others like it was a place that really existed. 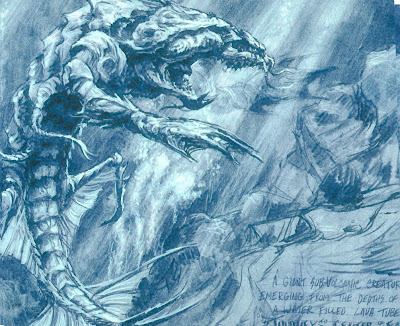 The creatures were my creations that I believed could really have evolve. The team was VERY amused by the names I gave them like the "Moss plucking Skenk", "flying nudibranch" and "leaping tri-pedal beetle". 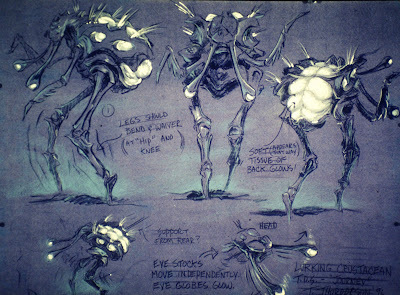 You should have seen the figure animation department trying to say the names when they were building the creatures. The meetings were a real hoot! The creatures have parts that glow because..well, they eat the phosphorus and glowing vegetation, of course." 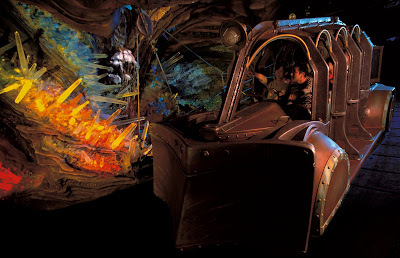 This next one shows the vehicle entering inside one of the cavern scenes where guests can see the Lava monster's giant egg sacks. The next picture is a photo of the model Tom Art Directed inspired by his renderings . 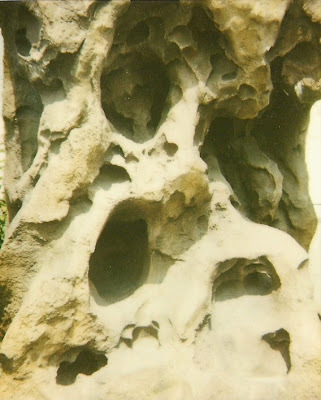 The photo below was shoot by Tom at WDI: "This is the "Test" in full scale using concrete that the WDI rockwork department did to show me. They wanted to see if they could duplicate my designs in the rack sculptures." This next painting Tom created is one of my favorite and absolutely gorgeous. 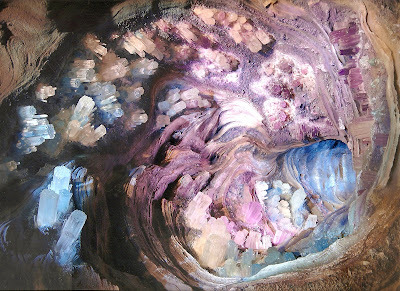 It shows the scene of the "Storm upon the subterranean sea" at the center of the Earth! 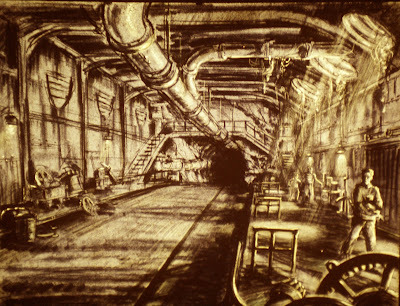 Tom states, "I did take certain key scenes from the book, like the idea of a "subterranean sea". Here is a rendering that shows the way I pictured such a place. A cavern so huge it had it's own weather and atmosphere inside. I wanted it to feel very phosphorescent and electrical and that those were the only sources of light so deep below the surface." 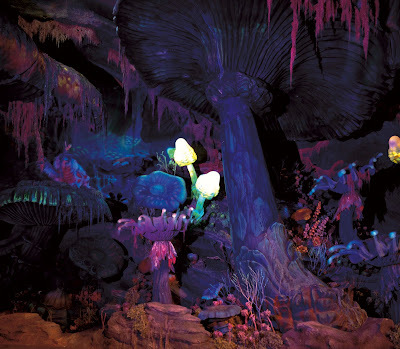 Of course there is the climax scene of the attraction, the encounter with the Lava Beast - in the ride, one of the biggest audio-animatronic ever built by WDI. 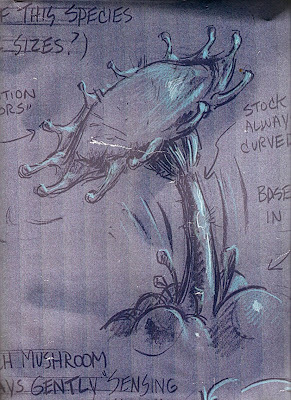 Here is Tom's early concept for the Lava Creature. ...and the spectacular final painting of the scene! 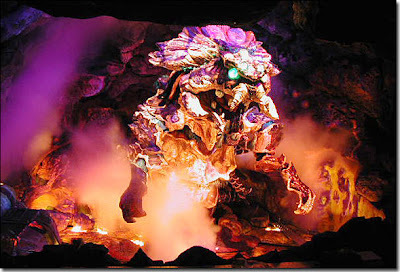 Here is a picture of the Lava creature, in "real". Tom recalls, "I liked a few elements from the studio tour but things like the creature being a worm was not as exciting for me. I wanted to be scientific in how I made this ride believable. 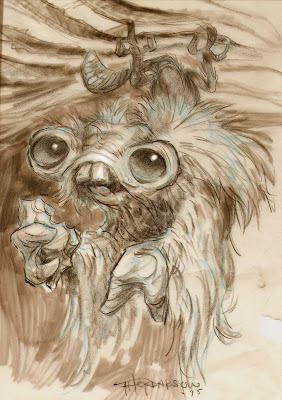 The creature, in my mind was a prehistoric life form that, because we were in a lava tube peppered caldera of rock, had to look like it could have evolved to withstand incredible heat and yet move through tunnels with great speed. 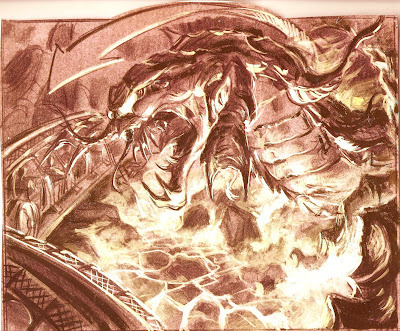 If you look at the first drawing of the lava creature, it is almost like a crustacean, hard exoskeleton amour to insulate it from the heat. However, it could swim out into the undersea tunnels too, to the open sea. Even when I deal with fantasy..I like to believe it could be possible in some way." 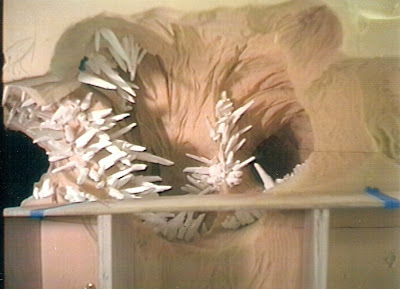 Right after the attack, the ride vehicle is going up at full speed, escaping from the creature and the center of the Earth. Tom did some storyboard proposals for this sequence and here they are. The first one shows people as the vehicle is launched in his fun storyboard, but in reality, it's exactly how your face is looking in this high-speed scene! The next one is a "leaping idea in the final run". For technical reasons the vehicle couldn't actually jump over a gap, but the final effect is almost the same. 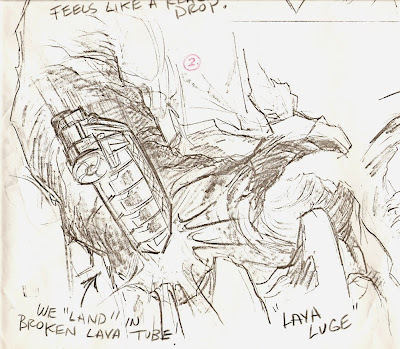 Tom did also a concept for the car landing in a "lava tube" after the above "flight". Tom has great memories about the design of that scene. He elaborates, "Then came to the part in the ride where the vehicle accelerates and we are sucked into the erupting lava tube. Just before we almost get eaten by the lava creature, we are blasted out the top of the volcano. I wanted it to feel like we are suddenly air-borne and maybe feel zero gravity for a short moment. Well...they said,"Ummmm, Ok...so for how long are we at zero g's?". I was busy painting a key frame at the time and said,..."Ohhh, I dunno, 10 seconds or something". Well..that taught me a lesson in being careful what you ask for as a show designer at WDI. Two days later they take me to a private pilot in Malibu. He was told to take me up in his small plane and test what 10 seconds feels like in zero gravity. He had said he could fly small parabolic arcs like the big planes do for NASA to train the astronauts. So....this we did!" Tom continues... "I held a chalk eraser in my hand as I was loosely belted in the back seat of this flying Volkswagen of a plane...and the pilot, at 10,000 feet over Malibu began zero gravity manoeuvres. When the eraser floated from my hand, we were at zero G's and he held that speed and arc as long as he could...well, 10 seconds is an eternity at no gravity for the average person!! In the end, we never do zero in the ride as the ride was built...just about .1 or .2 for a couple seconds when you first blast out and down. Anyway...it was a fun memory." 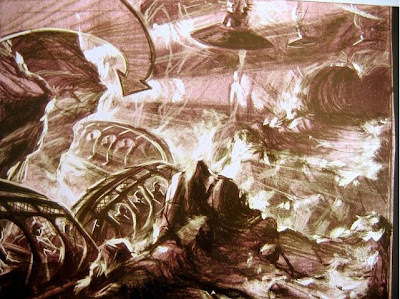 This last concept-art shows the unload area of "Journey to the Center of the Earth". 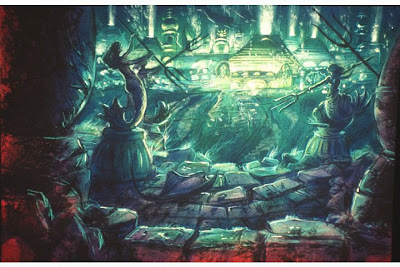 We will now see Tom's artwork for 20000 Leagues under the sea. 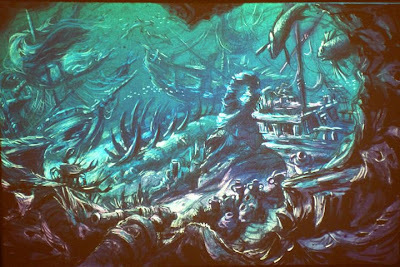 Tom states, "Here are a few of the storyboards I did for the 20,000 Leagues Under the Sea ride. In the beginning, I was developing ideas for both rides. 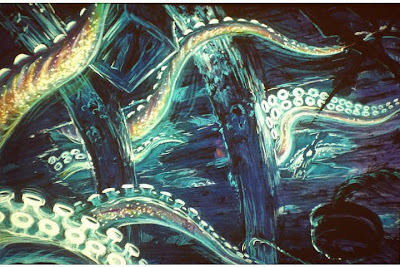 These storyboards and the familiar shot below of the first mini sub design showing the giant squid attack was my pass. It was the first image the press saw in the project announcements in the beginning of TDS. The ride was turned over to other art directors from there and I focused on journey through the finished models and drawing package." And this one is a "view of Atlantis". And this one the "sunken ship hull". 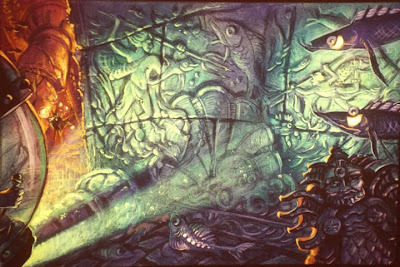 This last "20,000 Leagues" painting is of course showing the giant squid attack as Tom saw it. 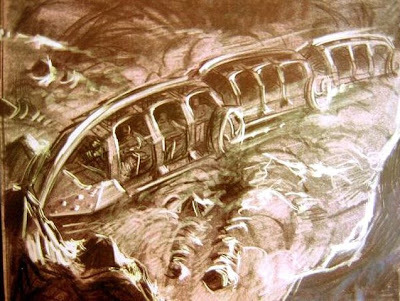 Creating a land or an attraction is never the work of a sole person of course, but considering the obvious contribution of Tom's design to Mysterious Island attractions, I think it's fair to say that he fully deserves the tribute I'm doing today, and I'm quite sure you agree with me. So, it's with pleasure that I let Tom conclude this article. Tom agrees and states, in his own words, "With all my passion for these rides, they would never have made it to being built without all the amazing team I worked with at Imagineering. It definitely does take a team of minds to make it all a reality. I would like to personally acknowledge the talent of Imagineer, Greg Combs who was so instrumental in his leading the show/set effort that brought all this craziness into working drawings and reality. Also, to Imagineer, Gwynn Ballantyne, who took the baton into the field and saw that all this and her own creative contributions would be become something we could all step into as the ride it is today. Thanks so much Gwynn. Lastly, to fellow show designer and Imagineer, Dave Durand. He was the creator and Art Director of the Crystal Skull, Indiana Jones ride for TDS and I recall many a day when we had lunches in the courtyard there at WDI and inspired each other with our passion for making magic and adventure we believed Walt would be so proud of today! I would like also to remember you that Tom Thordarson have his own web site and a gallery in Hawaii - more precisely on the Island of Oahu - where you'll be able to find his beautiful Tiki and Hawaian artwork, including the Tiki idols series. Some of them are on sale, and whether it is the originals or very affordable prints, any Tiki lover will find his happiness! 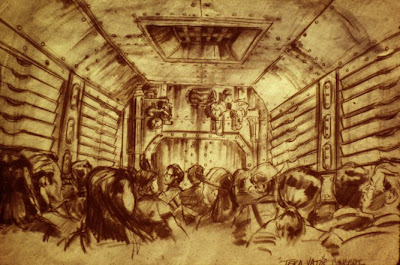 Also, if you're a fan of Tom's artwork and want to contact him, feel free to do it through his MySpace page. Tom have also a new gallery in Honolulu, Hawaii, in the U.S. Navy Exchange Mall. It's the "THOR STOR" in the NEX Mall. 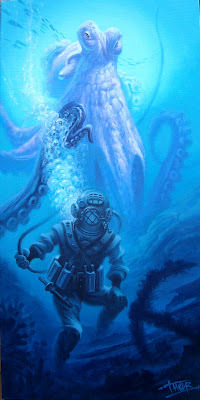 Most of his underwater and diver paintings are there now. 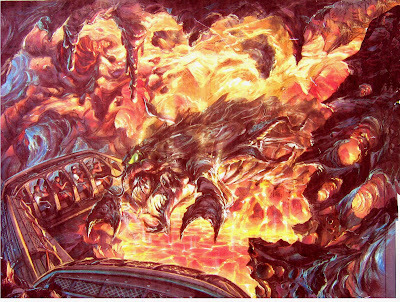 Below is a painting he just finished, and you can see how his Disney Sea past influenced his work today. 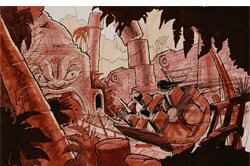 Please have a look to the previous article to discover Tom Thordarson Tiki and Pirates artwork. Translate the D&M page instantly !